The GRMA/SLR Annual Meeting is held the last Tuesday of February every year. It’s a time for members to come together, network, share local bites, and brainstorm with each other. 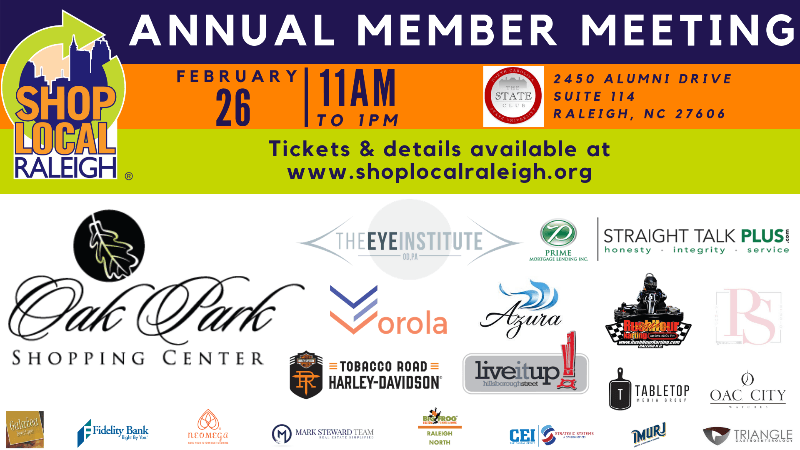 We will review what’s happening in our local area and hear what Shop Local Raleigh- Greater Raleigh Merchants Association is up to. All members and guests are invited to attend. Tickets on sale now! $15 for members and $20 non members. Lunch is included with your ticket. Guest speakers, prizes, and gift bags will round out this fun and informative event. We hope to see you there! Plated lunch includes your choice of entree accompanied by a house salad, dinner rolls, dessert and tea or water. Thank you to our Presenting Sponsor Oak Park Shopping Center for helping to make this event happen! Sponsor- We count on our loyal supporters each year to grow the event and make it more inviting, informative, and well, fun! Sponsorships are now available. Contact Harmony@shoplocalraleigh.org for more information. Attend – Purchase your ticket and invite your staff or a fellow business owner! Volunteer – We always need a few hands to put together gift bags, set up, work the registration table, and clean up. Float Decorating at The Devilish Egg and Knack Holiday Blood Drive Monday!